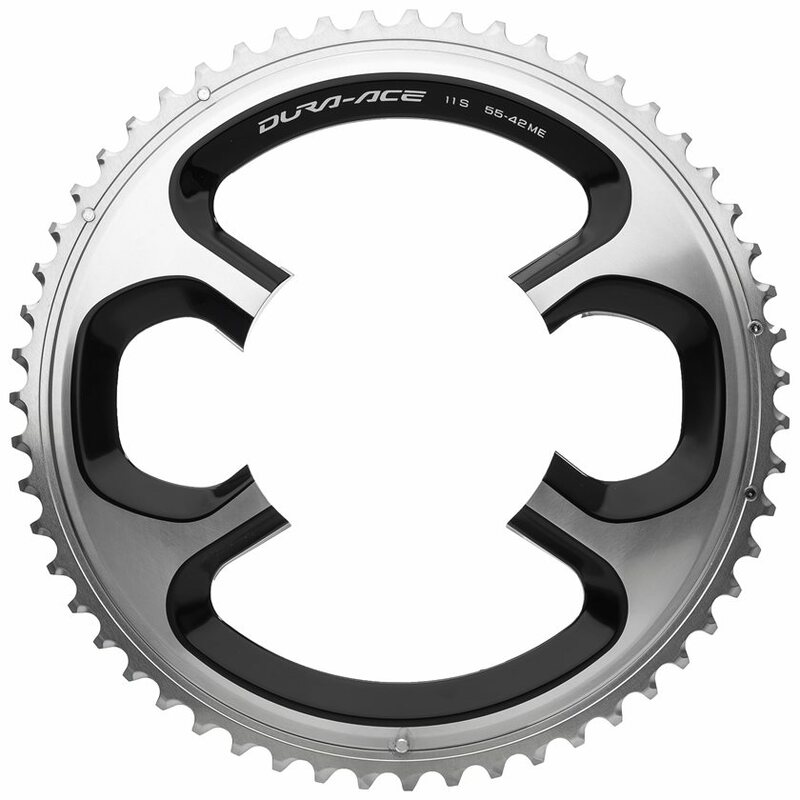 The Shimano Dura-Ace 9000 Chainring fits the new 9000 series Dura-Ace crankset which utilizes a 4 arm x-shaped spider and a 110 bolt circle diameter. Shimano makes the 5th arm disappear, shaving some weight, yet still produced the stiffest ring to date. The gain in stiffness comes from Shimano's Hollowglide Technology and integrated chainring nuts make replacement a very simple task. Chainrings are designed to work together as a set. For crisp and accurate shifting, ensure you are purchasing the correct ring to match your specific tooth count. Splendid. Running it in a 53/36 setup! i wanted to have an easier climbing gear, without sacrificing my 53 for descending... so i decided to try a 53/36 setup. lo and behold, it works well! i run mechanical Dura Ace 9000. the shifting from little to big is not as 100% flawless as 53/39, but it definitely is worth a bit more noise when going to my big ring. i found that i need to be much more deliberate in my shift so as to make it as smooth as possible. i bet on electronic shifting there would be zero problems, as my human error cannot help but crop up every now and then. Dura Ace chain ring is simply the best. Jenson USA had the best price compared to other retailers using the next-day shipping option! Very pleased with my purchase! What can I say? It’s a dura ace chain ring and I’ve had it a few weeks and so far it’s worked perfectly! Highly Recommended. Best price at Jenson USA! Used this to replace a compact ring that came with my new bike. Changed out D/A 9000 chain rings to 52-36 and 12-28 cassette. This combination provides better overall rollout for my needs. Easy swap out, new chain length necessary going to smaller chain rings but derailleur adjustments not necessary. Light weight with flawless shifting and strong zero flex. Expensive but worth the cost IMO. Protect the investment with regular drive train cleaning/maintenance and chain wear check. Jenson had the best price ( by far!) and when they found that they didn't have it, they honored the low price and got me one super quick. You guys are the best! Excellence communication. Great price. Quick shipping. Delivery was faster then expected. It's Dura Ace, what else can be said! I was looking for some options beyond my compact 50/34 and my mid compact 52/36 so the new combination keeps me from winding out on fast decents and long flat stretches. It's nice to have options. Easy to change out makes it even better. If you like climbing a lot a 36 inter chainring is the way to go. I'm such a good friend I bought two one for my teammate. When I ordered it said the item was in stock but then I was told it was backordered. It took 2-3 weeks to arrive. Fortunately I was not needing it for any rides I was doing. Was happy to find this available online in a 36t as I swapped out my 39 tooth. The 53/36 tooth setup is perfect and shifts no problem. It arrived up to CANADA in about 3 business days. Quality Dura Ace part as you’d expect. It was time for a new drivetrain after thousands and thousands of miles on the old set up. Small investment for a big difference. Replaced when the original teeth looked like nubs. Do it before your chain jumps when you put down that massive power. Great price on quality Dura ace chain ring. Sh ipped quickly. Cured my chain ring noise and looks great too. I'd like to put a 55/42 set on my Ultegra 6800 crankset. But givent that Ultegra chainrings do not come in that size/combination, I'd like to know if the Dura Ace 9000 chainrings are interchangeable with Ultegra 6800 chainrings? If so, do the colors match? BEST ANSWER: The colors do not match but the chainrings will fit the Ultegra crank just fine. Would an inner one of these DA 9000 chainrings (like 34 or 36 teeth) properly fit on the new DA 9100 crankset? BEST ANSWER: You would need a flux capacitor adaption unit. I have a 52-36 set up but feel I need more ease on climbs. Could I switch out the 36 for the 34 without chain length problems? BEST ANSWER: That combination could introduce some issues in extreme gear combinations, and front shifting would likely be very poor as the chainrings are specifically profiled for the 52/36 and 50/34 combinations. Your better bet is to go with a bigger cassette, perhaps an 11-32T in the rear and/or a longer cage derailleur to run the bigger cassette. I currently run a 52/34 combo on my bike with Ultegra Di2. While the shifting is not perfect, it does work. I like this combo beczuse I get the best if both worlds: a bigger gear for rollers and descents, and a smaller one for climbs. Would this be compatible with the Shimano 105 FC-5800 11 SPD Crankset? BEST ANSWER: Yes but why bother u can get a full 5800 crankset for this ring set cost? Yes, they will fit, but the colors won't match. I just bought a Quarq Elsa RS which is designed for this chainring. 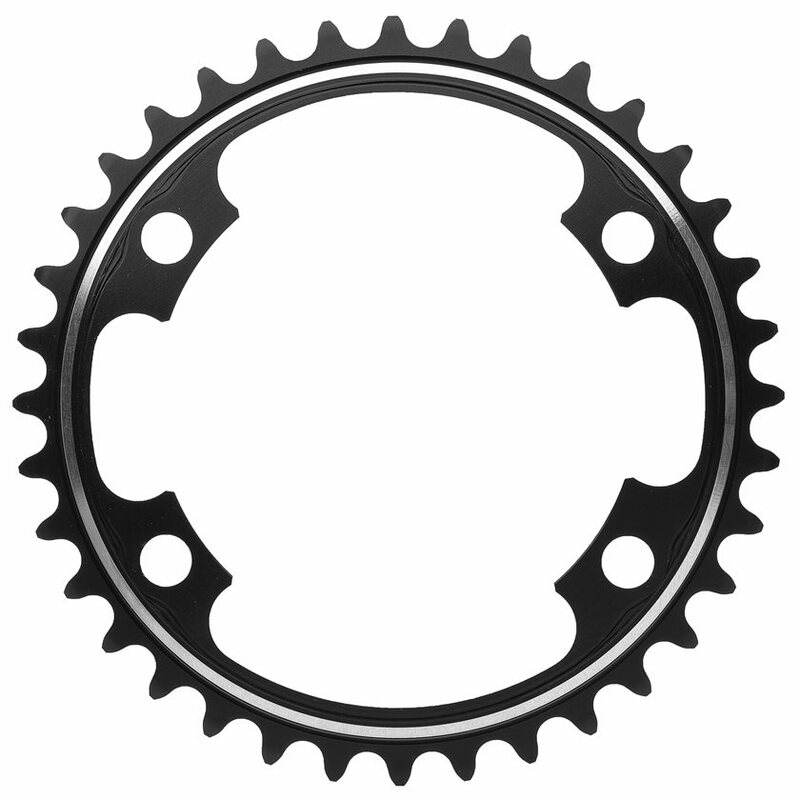 Can I use a 6800 inner chainring (which I already own) with a 9000 outer chainring? I'll be running a 52/36 setup. BEST ANSWER: It will fit. I don’t believe there will be a tooth timing issue. Personally I’d spend the ~18$ on the DA ring and be done with it though. BEST ANSWER: Yes, they should fit fine.